When editing a document, you definitely have to replace some text so that it becomes better. During your first draft, you write the information as it flows out of your mind. After that, when you read the text, you find that some parts need to be replaced with better words, phrases, sentences and even paragraphs. When it comes to editing a PDF file, you need an editor that can easily replace PDF text without affecting the formatting of the rest of the document. This article looks at some of the tools that you can use to replace text in PDF files. 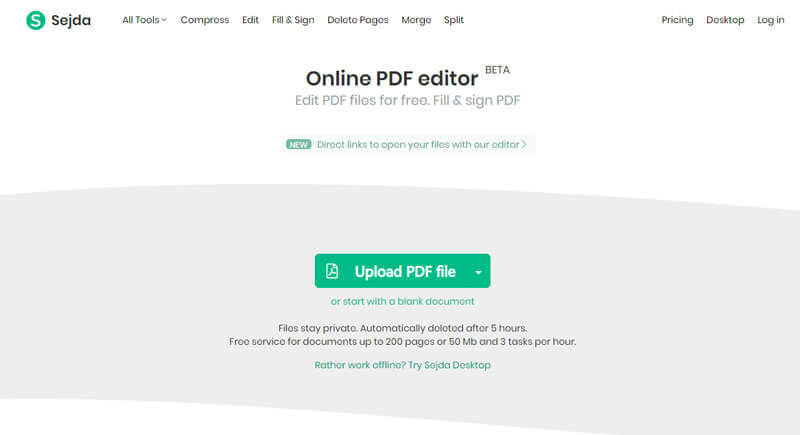 PDFelement ProPDFelement Pro comes with versatile tools, laid out in a great interface, allowing you to edit your PDF fully, and with a lot of ease. With the help of this PDF editor tool, you can easily replace text in PDF files. You can select a few sentences or entire paragraphs which need to be replaced. The tool enables you to edit every item that you find in a PDF file, and this gives you full control of how the PDF file will look and flow. After you've downloaded the program, you can click on the icon to start the PDF editor easily. Simply drag and drop the desired PDF file onto the interface and it will be automatically imported to the program. 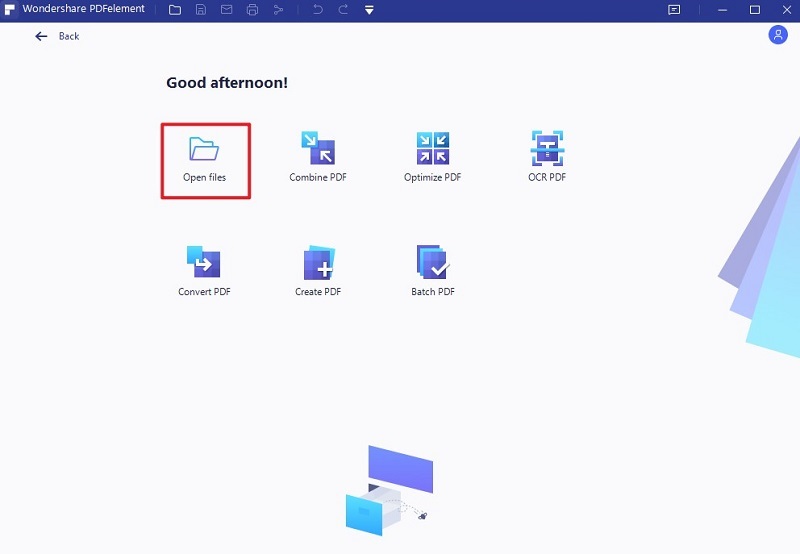 You may also use the "Open File" feature and then navigate to the location of the PDF file and select it for loading. You will get a preview of the pages and you can select the page were you need to replace text. Find Text in PDF – Once you have loaded the PDF file, use "Command + F" and get access to the "Find" window. Now look for the keyword or phrase that you want to find within the document. 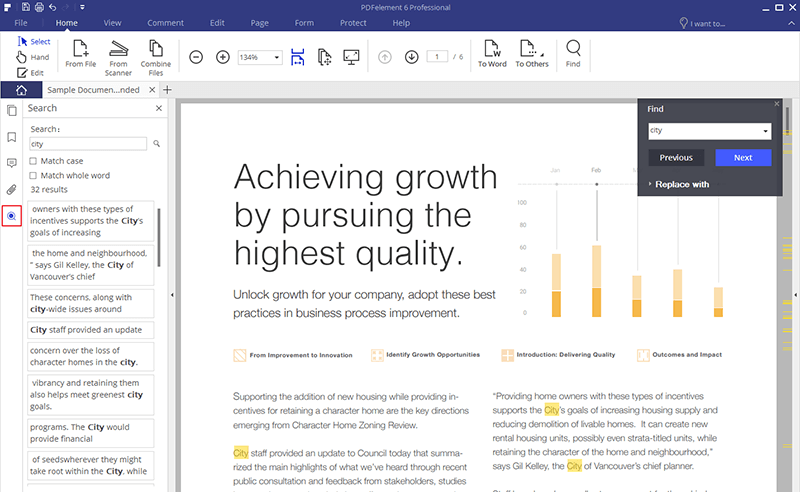 Replace Text in PDF – Use the "Command + F" feature and get to the "Find" window. Now click on "Replace With" button. You will be able to type the word or phrase that you want to replace and also the words the new words or phrases. Click on the "Replace" button and all selected text will be replaced with the new one. Replacing text in a PDF file using PDFelement ProPDFelement Pro is very easy. It follows the same process as that found in Microsoft word. You first select the words that you want replaced, and then define which word will replace the old text. By using "Command + F" you will edit large parts of the document within minutes. If it is one keyword that you want replaced, you will save a lot of time that you could have used manually looking for the keyword and replacing it. That is why this tool is becoming very popular. Below you will find some of the exciting features of this tool. With this PDF editor software, you can create new PDF documents from the start. You can also convert other files to PDF or PDF to other file formats. You no longer have to go looking for generic PDF files. You simply crate your own from scratch. Also edit forms that you get from other sources. The layout of the PDF tool is designs to be seamless, with editing features clearly displayed so you work faster. You can now add a digital ID to your PDF documents and also set the permissions of your PDF files for protection. You can edit and convert scanned PDF files with advanced OCR feature. Adobe Acrobat Pro was the first PDF editing program and has some advanced features that allow you to edit and replace text in PDF file. Though most people say that it can be complicated to use, replacing text in a PDF file is quite easy. Here are the steps to follow when you need to replace text in a PDF file. Step 1. Go to the edit tab and then select "Find". Step 2. Now type in the word that you want to replace. Step 3. Click on the down arrow to view the parameters for the search. These parameters are: Whole Words Only, Case Sensitive, Include Bookmarks, or Include Comments. Step 4. Click on "Replace With" and then type in the new word that you want to appear instead of the old one. Step 5. Unlike some other tools, Acrobat Pro is not able to replace all instances of the keyword at a go. You have to hit the "Next" button and then replace that instance. You have to keep doing this until Acrobat tells you that all instances of that word have been replaced. There are many online tools that you can use to replace text in PDF online. Some of them allow you to edit the original text and would be best suited for replacing many similar words within the document. However, there are others that do not allow for editing of the PDF original text and these should only be used when replacing a few words. Here are the top 3 online PDF editors to use when replacing text. Sejda is a user-friendly online PDF editing tool. You do not need to install any software and it does not need any registration. With the help of Sejda, you can replace text in PDF online for free. The beauty of Sejda is that it allows you to edit text directly on the original PDF. The tool works on all computers, and there are Smartphone and tablet versions too. You can convert, edit, merge and split PDF documents using this tool. 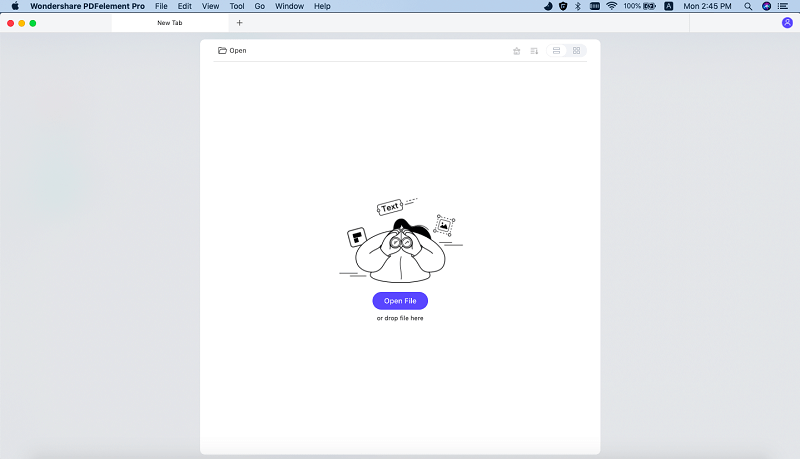 Ease of use – this tool lets you edit your PDF file with ease. Works on all platforms – This works on all operating systems including those of mobile phones and tablets. Bates numbering – this is a numbering system used for legal documents and cannot be found in other online PDF editors. Sejda is able to provide bates numbering. Works online - This tool allows you to work without any registration and works on all browsers. There is a desktop version which you can use to work when offline. It makes Sejda a PDF editing service and not just an application. Some functions are limited – this is the one and only con of this marvelous online PDF editing tool. The editing function is limited, although you can merge, split and convert documents with full functionality. SmallPDF is generally designed for user experience rather than functionality. It cannot compare to most other online PDF editing tools, but this ease of use has made it quite popular especially among people who want to quickly edit a single page on a PDF file. You can split, merge, rotate and convert documents. However, when it comes to replacing text, you have to whiteout the original text and the type over the white area. The main focus of the developers is the user experience. It was purposely designed to be simple but functional. This is another online PDF editor that does not require you to register. You can also download Chrome extension tools for including in your Chrome Browser. 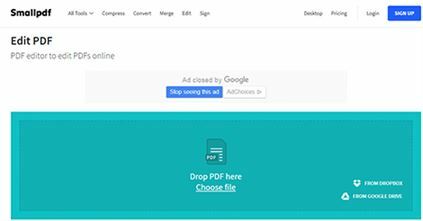 Despite being a simple tool, it probably has the best PDF compression capability among online PDF editors. This is one of the issues that plague what would otherwise be a marvelous tool. There are several important functions that one can do, but it would be great if more functions were added to it without spoiling the user experience. 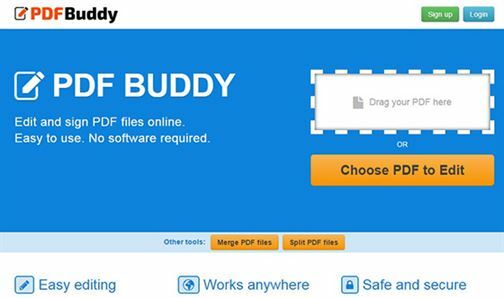 PDF Buddy is another PDF editor that you can use to replace text in PDF online. It is quite simple to use and also has basic functionality. You have to add a whiteout box and type over it in order to change the text. This means that it is only best for simple replacement of text. Quickly uploads and edits files. It has online instructions that show you what to do next. You have to register in order to get t use the advanced functions. The limitations go beyond editing text. You cannot merge PDF files when using this tool. It does not allow you to add security features to your PDF file.